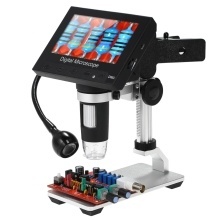 This digital microscope comes with 4.3 inch LCD display, 1000X magnification, and adjustable high brightness 8 white LEDs. It will help you see and analyze tiny objects in microscopic details. Come with a metal stand to help support the microscope and a USB clip lamp for lighting. Large 4.3 inch LCD display, allowing you to see all your observations in detail and providing you a view of 1080P/720P/VGA resolution. Magnification adjustable from 1X to 1000X of continuous magnification system. With a 360° adjustable gooseneck LED lamp for auxiliary lighting when operating. True 2.0MP sensor to capture and save high-resolution images and videos of your specimens. Built-in 8 white LED lights and can adjust the illumination. Supports inserting TF card to take photos and video for network sharing and computer saving. Powered by USB, easy to charge and play for use. Professional and adjustable height of metal stand for hands-free operation. Suitable for industrial inspection, electronic accessories inspection, textile inspection, jewelry inspection, printing inspection, etc.